Note: I advise you watch Unbreakable and Split before reading any reviews for Glass. Glass is an alternative take on the superhero origin story as David Dunn and Kevin Wendell Crumb start to question their supernatural abilities. The film is set in the same universe as M. Night Shyamalan previous films Unbreakable and Split. All the main cast from the previous films reprise their characters in this film. The main cast consists of James McAvoy, Bruce Willis, Samuel L. Jackson, Sarah Paulson and Anya Taylor-Joy. It deviates from the traditional superhero genre by focusing on the psychology of its main characters and doesn’t rely on big action set pieces to intrigue its audience. The film follows themes established in the first film in the series Unbreakable and only brings in certain aspects that were established in its sequel Split. If your favourite film in the series so far was Unbreakable you will enjoy Glass because of their shared similarities. The similarities in both films allows the mystery surrounding the series to finally come to a close. This trilogy started nineteen years ago and is impressive that the series has maintained its level of quality after all this time. You can tell that the director M. Night Shyamalan is passionate about the series as he doesn’t normally do sequels to his films. 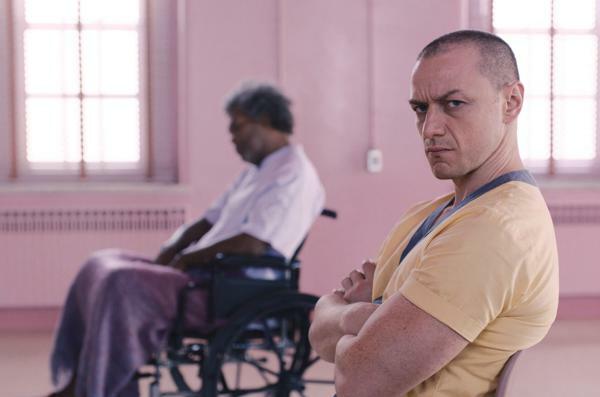 He has also confirmed he will not produce a sequel to Glass so this film is the final entry in the series. Night Shyamalan’s has redeemed himself with this latest release after he released the critically panned The Last Airbender and The Happening in the 2000’s which tainted his filmography. The writing in the film is questionable at times as some conversations in the film can come across as unnatural. I believe this is due to issues with the script and isn’t caused by the acting featured in the film. James McAvoy’s performance in the film is a real showcase of his acting range as he effortlessly interchanges between the twenty-four personalities his character possesses. With the surprise inclusion of Black Panther being nominated for Best Picture at the Academy Awards this year, it would be outrageous if James McAvoy isn’t considered for a best actor nomination. The run time for the film clocks in at 2hr 9 minutes which is needed to establish the connections for all the characters from the previous two films. This doesn’t affect the pace of the film and compliments the film’s climax well. Glass received an age rating of 15 in the United Kingdom, so it is targeting a mature audience and will be inappropriate for younger audiences. This is due to the inclusion of graphic violence and swearing. The film seems to have been faced with mixed reviews with critics. At the time of writing this, review aggregate site Rotten Tomatoes awarded it 37% while its competitor Metacritic gave it 42 which is lower than the two previous films. This can be subject to change in the following weeks. Glass is a great film for fans of the franchise but does require you to be familiar with the previous films to enjoy it. It is also one of the first major releases of the year, so I believe it will do extremely well at the box office due to the lack of competition.